Famous for their platform’s ringing denunciation of polygamy as one of the “twin relics of barbarism,” the Republican party took a strong stand against Mormonism. The Democratic party was more divided. Wedded to a policy of popular sovereignty, traditionally protective of individual liberty, and hostile to moral reform movements, Democrats would seem to offer the Mormons in Utah Territory the local control to practice their religion freely. Delana Eckels, however, was President James Buchanan’s nominee as chief justice of Utah Territory. Eckels was a fierce defender of popular sovereignty and generally opposed to moral reform. But he was also implacably hostile to the Mormon practice of polygamy. This article examines Eckels’s role during the Utah War in order to explore the internal divisions within the Democratic party between maintenance of the law and federal authority and popular sovereignty. In December of 1849, as the debate in Congress over the Compromise of 1850 was about to begin, the Senate confronted the seemingly innocent question of granting Irish temperance reformer Father Theobald Mathew the honor of sitting on the floor of the Senate. In the sectionally fraught atmosphere of the impending Compromise debate, the dispute over the seating of Father Mathew rapidly became a heated rehearsal for the larger encounter to come. 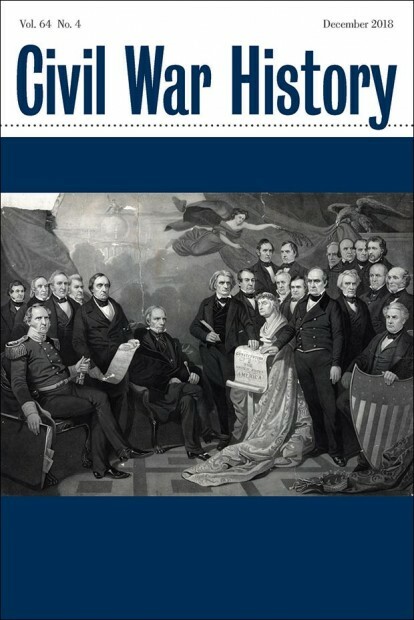 The seating controversy involved questions about the role of political motives in the sectional dispute, divisions over the place of sectionalism in American politics, conflicts over the nature of the Union and the meaning of state equality, differences over abolitionist tactics, arguments over the morality of slavery, and revelations of southern ambivalence over the institution that gave definition to their section and structure to their lives. Such leading mid-century political personalities as William Seward, John Calhoun, Henry Clay, and Jefferson Davis, participated in the debate over Father Mathew, and their confrontation foreshadowed not only the impending debate over the Compromise, but the intensifying debates of the coming decade that would determine the fate of the Union. Nicole Etcheson is the Alexander M. Bracken Professor of History at Ball State University. She is the author of several books, including the award-winning A Generation at War: The Civil War Era in a Northern Community (2011). Harris, William C. Lincoln and Congress. Reviewed by Peter Charles Hoffer. Stout, Harry S. American Aristocrats: A Family, a Fortune, and the Making of American Capitalism. Reviewed by Brian Luskey. Robinson, Michael D. A Union Indivisible: Secession and the Politics of Slavery in the Border South. Reviewed by Lawrence Celani. Zimmerman, Andrew, ed. The Civil War in the United States: Karl Marx and Friedrich Engels. Reviewed by Heather Wilpone-Welborn. Williams, David. Georgia’s Civil War: Conflict on the Home Front. Reviewed by Scott A. MacKenzie. Stith, Matthew. Extreme Civil War: Guerilla Warfare, Environment, and Race on the Trans-Mississippi Frontier. Reviewed by Adam Domby. Clampitt, Bradley. Occupied Vicksburg. Reviewed by Thomas W. Robinson. Hess, Earl J. Braxton Bragg: The Most Hated Man of the Confederacy. Reviewed by Aaron Astor. Keating, Ryan W., ed. The Greatest Trials I Ever Had: The Civil War Letters of Margaret and Thomas Cahill. Reviewed by Angela M. Riotto. Alford, Terry. Fortune’s Fool: The Life of John Wilkes Booth. Reviewed by David Patrick McKenzie. Caudill, Edward and Paul Ashdown. Inventing Custer: The Making of an American Legend. Reviewed by Cheryl A. Wells. Smith, Timothy B. Altogether Fitting and Proper: Civil War Battlefield Preservation in History, Memory, and Policy, 1861-2015. Reviewed by Adam Petty.